PennsylvAsia: Gwangju National University of Education president receives University of Pittsburgh Medallion Award. 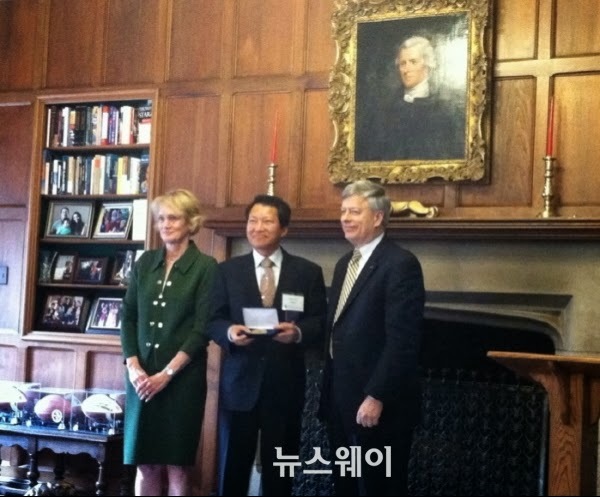 Gwangju National University of Education president receives University of Pittsburgh Medallion Award. Via Gwangju National University of Education, but watermarked here by Newsway. Park Nam-gi, the president of Gwangju National University of Education, was in Pittsburgh on the 1st to receive a University of Pittsburgh Medallion Award from Pitt chancellor Mark Nordenberg. The awards are issued to distinguished alumni on the occasion of the university's 225th anniversary (in 2012). Park earned his Ph.D from the University of Pittsburgh in 1993 and worked two stints as a visiting professor at Pitt in 1999 and 2000-2001. Lately, and most recently in July, he has led teacher-training and cultural-immersion programs in Pittsburgh with the Greater Pittsburgh Literacy Council. 광주교육대학교(총장 이정선)는 지난 1일 박남기 (교육학과) 교수가 피츠버그대학교 총장실에서 진행된 미국 피츠버그대학교 개교 225주년 기념 최우수 동문 시상식에서 대학을 빛낸 인물로 선정되어 기념메달을 수여받았다고 밝혔다. 이날 시상식에서 박남기 교수는 1989년 피츠버그대학교 초청 장학생으로 유학을 와 대학의 도움으로 새로운 세계를 열게 된 자신의 지난날을 회고하며 교육학을 공부하기 위해 피츠버그대학으로 유학 올 한국 학생 장학금의 종잣돈이 될 1만 달러를 기부하였다. 마크 노딘버그(Mark Nordenberg) 미국 피츠버그대학 총장는 지난 225년 사이 대학을 빛낸 개개인의 업적을 상세히 소개하고 축사를 통해 “세계 각국 다양한 분야의 대학을 빛낸 동문들을 보면서 가르침이 얼마나 중요하고 큰 영향을 미쳤는지 알게 되었다”며 “앞으로도 얼마나 오래 지속 될 것인가를 새롭게 깨닫고 교육자의 사명감을 느낀다”고 전했다. 또한 박교수는 “유학 당시 생활비를 포함한 등록금, 장학금, 피츠버그대학 동문회로부터 두 번의 거액 장학금 등으로 새로운 삶을 펼칠 수 있었는데 그 중 일부나마 후배들을 위해 기여하게 되어 기쁘다”며 “대학 발전을 위해 향후에도 끊임없이 노력하겠다”고 소감을 피력했다. 한편 박남기 교수는 1993년부터 광주교육대학교 교육학과 교수로 재직하면서 세계비교교육학회 부회장, 초중등교육분과위원장, 교육청 업무평가 위원, 광주교육대학교 5대 총장을 역임하며 대학 및 지역사회 발전에 기여해 왔고 현재 츠버그대학교 객원교수로 활동과 함께 동 대학에서 1년간 연구년을 보내고 있다.